Stop what you are doing and consider breakfast in Las Vegas. 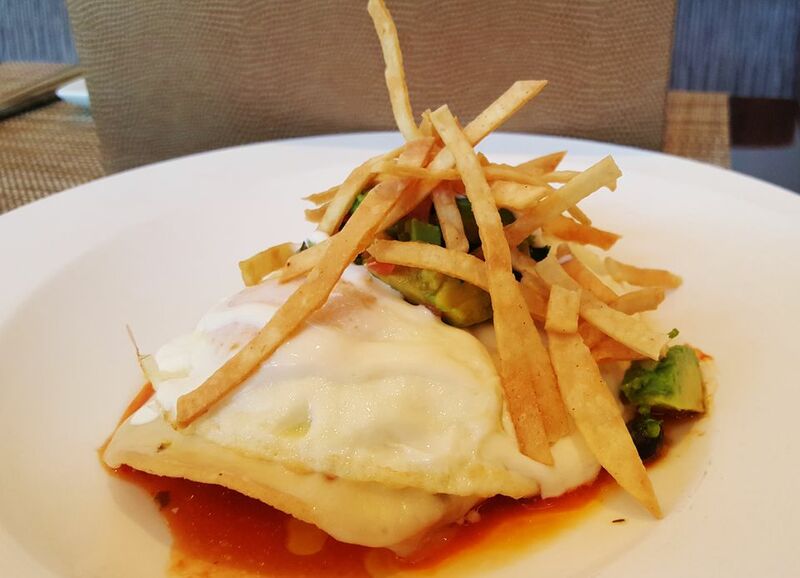 It’s hard to motivate yourself after a long Las Vegas night but the Egg Ranchero at MOzen Bistro at Mandarin Oriental is the type of entree that will solicit action on your part even under the duress of a “next morning in Vegas” situation. However, you might not want to stop there, ask about their pesto, if there is any dish with this lovely spread on it order that as well. You might need a morning cocktail or a long breakfast that transition into lunch. You can’t say that RM Seafood is flying under the radar in Las Vegas as it has become an institution at Mandalay Bay for years now but it feels like their ability to adhere to sustainable seafood practices on their menu is still underappreciated. Even while Chef Rick Moonen is at the forefront of the practice of understanding the journey and implications of what goes on to your plate from the ocean there is still a dire need to raise more awareness. What better way than an octopus that makes your knees weak with delight. The Charred Spanish Octopus with cherry tomatoes and fingerling potatoes is perfect for sharing. I should be telling you about having oysters at the bar while sipping on a cocktail that is ridiculously good. You see Other Mama is way off the strip and it is not off the radar for any local food lover. However, for the Las Vegas visitor who rarely leaves the strip this is so far off the radar that when you stop into Other Mama you’ll consider the low cost of living,the cheap real estate and the climate and you’ll wonder if a second home right near this gem is a possibility. It’s seafood from a socially responsible chef who has a conscious when he makes out his menu . It’s a home run in the exploding flavors department. This is a lock for one of the best meals you will have while on vacation. However, I am telling you to go to a seafood joint to have the Kim Chee fried rice with pork belly and fried egg. Why would I do that? It’s simple. You will have a friend who is hesitant about just a seafood menu in the desert and this is the dish that you will use to lure him or her out and off the strip. Then you will be blown away by the oysters Rockefeller and then the poke’ and then the ceviche and then... That is why you should have pork belly and rice at a seafood restaurant. It’s almost like you had to take the R train out past Flushing and you got off at Steinway and made a quick left before finding a little pizza spot that was said to have the best slice in NYC. When my pizza was delivered to me at Pizza Lotto the chef described his goal with pizza was to create a slice as close to the outer borough pizza of his youth. It’s New York City pizza style but different in that the crust has a bit more staying power. It keeps a shape a bit more but is not hard. It has some crunch while maintaining some of that chewy loveliness that a good pizza should have. However, you can’t fold it in half so the center still has some life in it even if it is that last slice of pie on the plate. If you find a seat at the bar you can look at their collection of beers. It swells to over 200 beers by the bottle and there are plenty of hard to find selections that will kelp you sharpen your beer tasting game. Have a rum aged beer by Innis and Gunn pop in some money in the video poker machine and you get a free beer. 200+ beers endless, angles for watching the games, Pool tables, Food service and during big game weekends a portable gaming kiosk to place your bets. Couple all of that with interactive gaming tables that allow you to get in a few spins of roulette or a couple of hands of blackjack during timeouts and you can bet that your entire sports bar experience is about to change. Bakery at Venetian Las Vegas. Once you manage to have some cake from the “Cake Boss” your world gets turned upside down and you begin to fall in love with icing and crave the fluffy insides of the best cake you have ever had. You can’t have just one pastry at Carlo’s Bake Shop so I recommend skipping a meal and making dessert your entire caloric intake while you are in Las Vegas. You’ll need a cannoli because who doesn’t but you’ll devour the puff pastry filled with chocolate eclair. The bite sized portions of the chocolate mousse cake are decadent and mischievous in the way they tempt you to have more than you should. The chocolate mousse puff is fluffy and sweet and just the right size so that you have three to satisfy your craving. You may recall a love for a Jack and Coke when you just started your foray into alcoholic drinks that didn’t include cheap tequila or wine coolers. Well, the Smoked Whiskey and Cola at Rx Boiler Room might sound a bit familiar but it is a long way from your early cocktail experience however, it has just enough nostalgia wrapped in it to make you consider ordering a second. It’s sweet, smoky and has a hint of spice that made me think of fall. Plus, it makes for a great picture to post on your profile page.